School Tent – Frame Type is very practical tent. The frame tents are free span, self-standing and needs less space for installation. The frame is made with strong iron tubes which can be installed easily. This tent used for small various purposes like dispensary, hospital, filed office, accommodation & storage in the field depending on its size but especially for School Class rooms in the camps. It is adaptable to all weather conditions. These tents are heavy duty, durable and easy to transport due to small components. 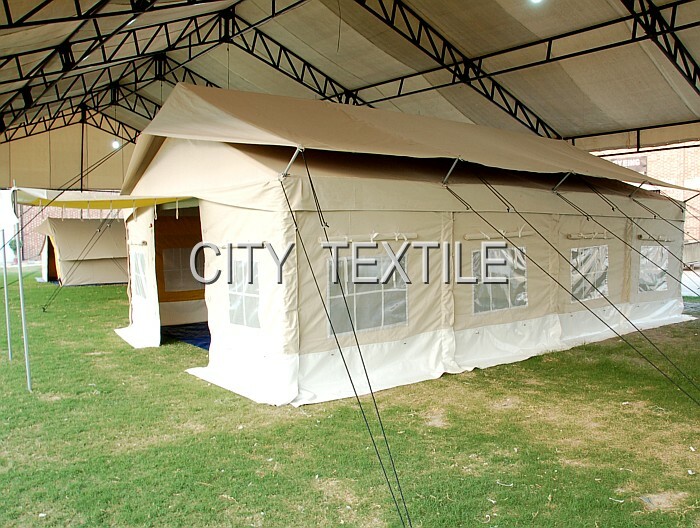 The tents are custom made and can be made as per requirement by changing windows, doors, HVAC provisions, ventilation openings, internal partitions and connectivity with other tents optionally. 350 ~ 450 g/m2 cotton/polyester blend waterproof and rot proof fabric. 125 ~ 170 g/m2 cotton/polyester fabric. 100 ~ 180 g/m2 Polyethylene (PE). Yellow / Light Green / Natural Grey. Anti-rust High Temperature powder coating / Galvanize. big windows mosquito net and with easy-to-use flap covers. All required resistant tools and accessories including a hammer, steel pegs and assembly instructions. Designed By Koncept Digital | Copyrights Reserved City Textile (PVT) LTD 2019.